as a recurring character in my art. My native girls (I made all of the girls and their poses up) are supposed to be from Devil's Island ,but alot of people think they are Hawaiian. However, they do not have this type of monkey in Hawaii! And my girls are often seen playing around in inappropriate ways with these creatures. The sailor hat is my little addition, but it gives people a sense of deja vu and they think they have seen this monkey before somewhere. My monkey has now become more of a character, drawn from memory. It's half human/half cartoon. But, it's still undeniably a squirrel monkey. From South America. It's the "monkey with the largest brain in relation to it's body size". My art is painted and drawn from my head, the landscape is made up, but it has a vintage feeling about it. It flows from my intuition, instincts and memory of everything in the world that I have ever seen in a lifetime. It is all about design, composition and making an entertaining picture. The narrative is about ambiguous relationships and what will happen next. It's all a mystery. Banjos are important American instruments. Banjos descended from gourd instruments brought to the New World by enslaved Africans as early as the 17th century. 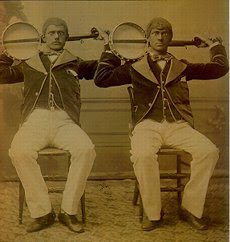 By the 1840's white musicians were playing them in minstrel shows. Later on they were heard in the Victorian parlor. 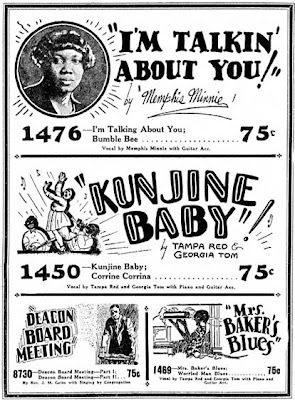 Later still, banjos were used in hokum, ragtime, jazz and bluegrass music. Primitive Banjos, Guitar Banjos, Mandolin Banjos, Banjo Ukes, Tenor Banjos, 5-string Banjos. 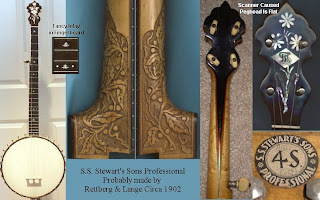 I always loved the details on the S.S. Stewart banjos. There are many wonderful vintage images of banjo players. Read up on the history of the banjo. A great American instrument. I have used them in my artwork because I love them. 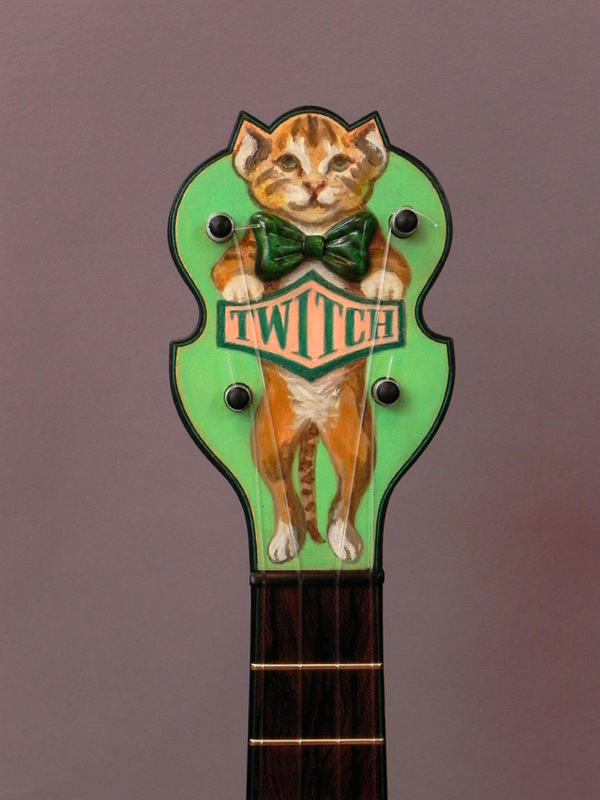 It looks like the very first Tickler Brand Ukulele (built by Lou Reimuller, designed and painted by Amy Crehore) has now sold. There will never be another one like it. It's one-of-a-kind. The number two Tickler Uke is slowly being built and should be finished around the first of the new year. It has completely different features- a different shape, an exciting mother-of-toilet-seat fingerboard and a carved headstock. It won't be fully painted on all sides like the first one. Instead, it will have more wood showing and some other details. 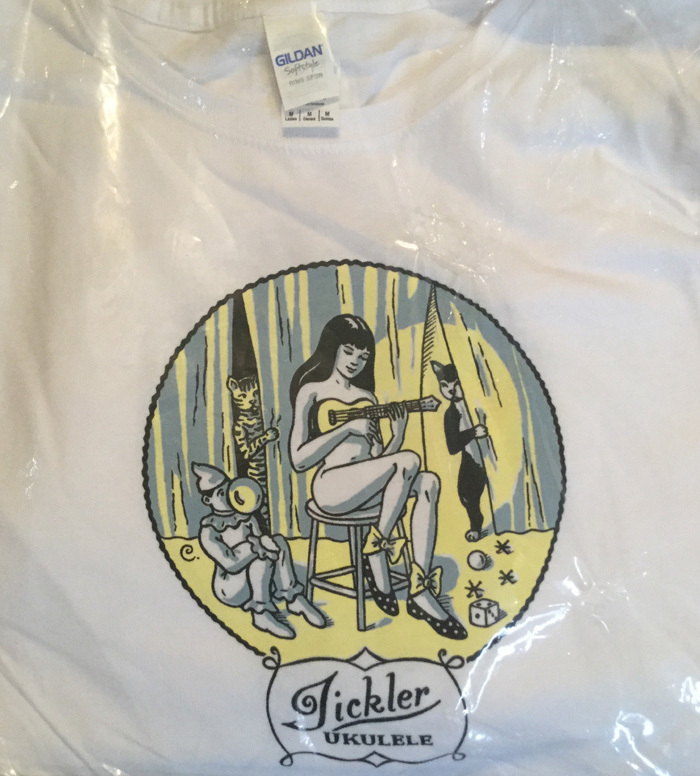 I hope to be finishing up the Tickler T-shirt design this week. I have to upgrade my website before Jan 1, also. Lots to do! I had tofu turkey this year at Govinda's restaurant in Eugene, OR. 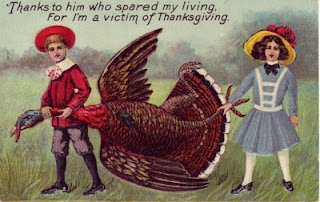 I often eat regular turkey for Thanksgiving, but sometimes I don't. I was vegetarian for a couple of years after I got out of college. "Diet for a Small Planet" was my guide book and I had a macrobiotic cookbook. My pure vegetarianism didn't last long, but I never went back to eating red meat. is a website founded by Karen Iacobbo and Michael Iacobbo, authors of "Vegetarian America: A History" (Praeger, 2004- book shown above which you can order right on the website). 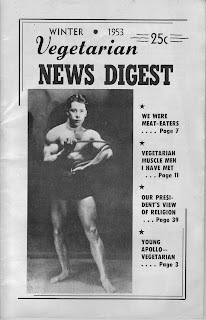 In the "museum" you can find all kinds of tidbits, articles and images about the history of vegetarianism from the 18th century on in America. That is where I found the holiday postcard and the vegetarian muscleman. Interesting! Thanks for the link Internet Weekly. "Honeybee" copyright 2007 Amy Crehore 8"x8"
Here is my little "Honeybee" painting all finished. I just shipped it off to Mark Murphy who will take it to Art Basel Miami and exhibit it in the "KNOW" exhibition where he will be selling his art books, plus original art from over 40 artists. This is the final version of the painting that boingboing posted about earlier ("Amy Crehore Paintblogging"), for those who were following my progress. 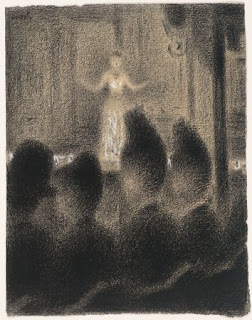 Georges-Pierre Seurat was only 31 years old when he died in 1891. Everyone knows his 10 foot long pointillist masterpiece, Sunday Afternoon on the Island of La Grande Jatte, which took him two years to complete. He apparently made over 60 studies for this painting. It is now hanging in the collection of The Art Institute of Chicago . 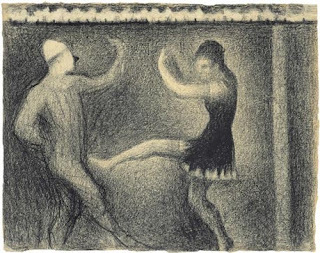 Seurat Drawings online exhibit at MOMA. It's worth a trip to NYC. I also talked with Mark Frauenfelder and my friend George from Eugene. I met Bob Dob, Cathie Bleck, Nathan Ota and more. I just missed Lisa Mertins (who drove all the way out to meet me, but didn't know what I looked like) and who knows who else. It was so packed that it was hard to meet everyone. Mr. Robert Berman, the gallery owner, was absolutely the coolest guy. The Modlins entertained us with their music. I just got back from L.A. and I had a wonderful time. It was hot down there! I'm going to tell you more about it as soon as I unpack and catch my breath. 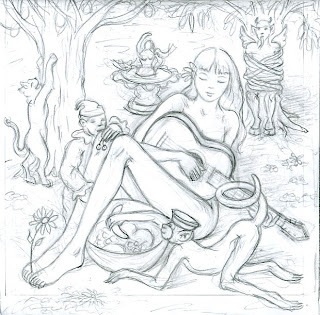 Meanwhile... here is the original pencil sketch for my "Deja Vu Waltz" painting. 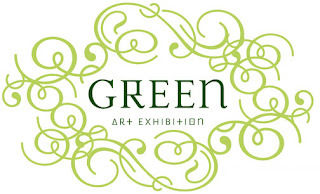 I will post photos of the Green Show art opening in a few days. P.S. Click on "vote for me" if you enjoy this blog. I'm back! I'll be back on Monday. Stay tuned for my report from La La Land. Mark Murphy, the curator, has posted more images from the upcoming GREEN Art Exhibition on his blog. I will be headed down to L.A. tomorrow for a few days. I can't wait for the opening on Saturday night (7-10pm). I'm excited to be a part of this show. 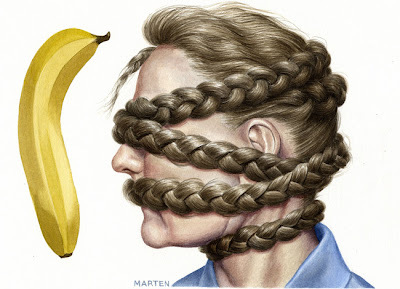 Dan Koeppel has written an interesting book called "Banana, The Fate of the Fruit that Changed the World". It's about the history of the banana. I'm back to work on my little "Honeybee" canvas today. This painting is for the Know Exhibition with Murphy Art Books at the Art Now Fair, Art Basel Miami. It will take place on December 6-9, 2007, 10am-8pm, Claremont Hotel, 1700 Collins Ave. (17th St.), Miami Beach, FLORIDA. There will be a special website for this show and I will blog about it later. Once again, Mark Murphy has invited a list of amazing artists to participate. I will head down to L.A. this Thursday for the GREEN show opening on Saturday where I will exhibit my "Deja Vu Waltz" , a large painting that includes all of my recent characters. My little pierrot thanks you, my cat thanks you, teenar thanks you, the girl with the guitar thanks you, the monkey thanks you, I thank you and even the devil thanks you....for blogging my new painting, "Deja Vu Waltz". 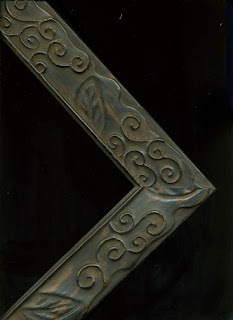 Carved Frame for "Deja Vu Waltz" Painting by Amy Crehore "Deja Vu Waltz" by Amy Crehore copyright 2007, oil painting on stretched linen, 24"x24"
Here is my new painting, "Deja Vu Waltz". Click on image to enlarge for the full effect. Bergamot Station, 2525 Michigan Avenue C2, Santa Monica, California. Over 40 artists were invited to participate in the upcoming exhibition "GREEN",curated by publisher/designer Mark Murphy. GREEN will feature original paintings, (24" x 24" and 24" x 36") that look to explore human interaction with nature. Featuring traveling artists, inspired artworks,and the music of SSI and the Modlins. The exhibition will continue until December 22, 2007. I will be flying down to Santa Monica for this event. I hope to see you there! Gotta have a girl. Girls are so important. And if she plays a guitar, more power to her, eh? I will show you more tomorrow. Stay Tuned. Birdbaths are cool - Another detail from "Deja Vu Waltz"
You've gotta have a cat in there... going wild...scratching a tree now, don't ya? 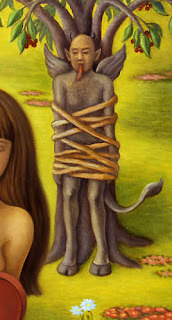 I'll blog a couple more details and then I'll show you the entire painting. Stay tuned. Here's another teaser for you from my brand spanking new painting for the "GREEN Show". The art exhibit opens November 17th at Robert Berman Gallery in Santa Monica, CA. Curated by the fabulous Mark Murphy, there will be about 40 artists in this show. Here's another piece of the puzzle. More coming soon! Okay, I am going to show you pieces of my new painting, "Deja Vu Waltz". 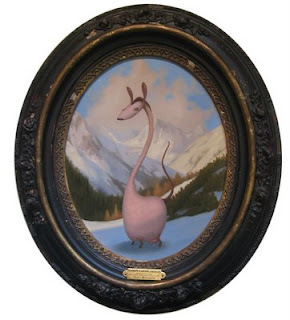 This painting is for the GREEN SHOW (opening November 17th in Santa Monica, CA). Here is the first detail. 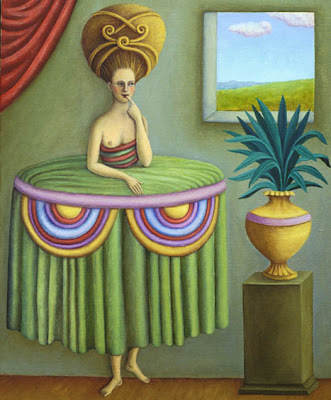 This painting has everything. All of my characters. Here you can see my little pierrot. Stay tuned as I unveil the rest bit by bit. This is a large oil painting on linen, 24"x 24". John Brownlee must have it stashed under his pillow for cold, rainy nights. 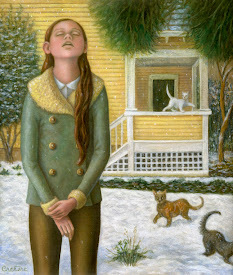 I have always admired Ruth Marten's art. She's a wonderful painter and illustrator. She has a thing for hair and has made some beautiful and humorous paintings using this theme (above). 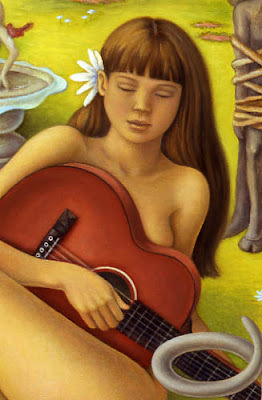 I picked out "Native Girl" from her site because I immediately recognized it as an old engraving that I used in 1990 as reference material for my painting called "Tableau". 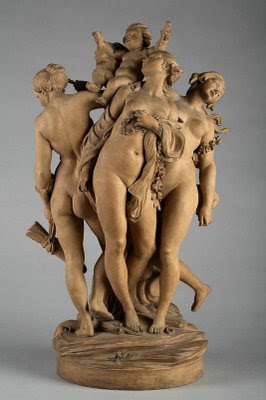 I have a big, fat book at home that is full of these engravings and it is one of my favorite things. 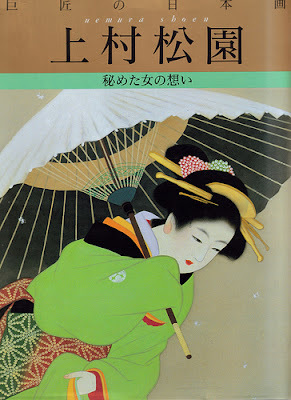 It's called, "The Complete Encyclopedia of Illustration" by J.G. 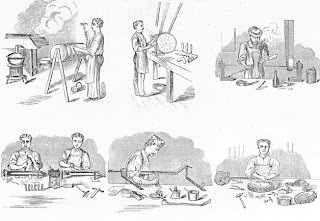 Heck (Park Lane publishers) which contains all of the original illustrations from the 1851 edition of "The Iconographic Encyclopedia of Science, Literature and Art". It is full of birds, beasts, people, landscapes, weather patterns, sea shells, you name it. I can't even describe how amazing this book is. I think that Ruth Marten and I may have some interests in common. P.S. If you like this blog, click on "Vote for me". Thanks! website. 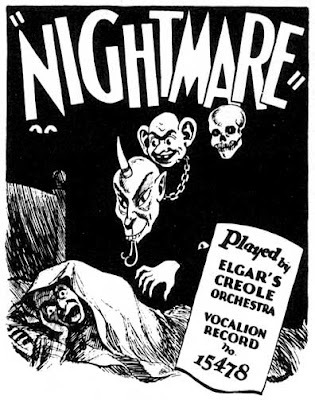 I have had that nightmare before! Yipes! I love the graphics and hand-lettering of the race record ads from the 1920's. I am back to blogging again. Today, I finished my painting for the Green Show (opens Nov 17 at Robert Berman Gallery, Santa Monica, CA). Yippeee. I am so tired, that I am giddy. I will not have nightmares tonight. I will sleep well from exhaustion. Tomorrow I will have the painting photographed. Then, I can show you. I'm really proud of it. It has all of my characters in it and more. I think I will call it "Deja Vu Waltz". Here are two pages from the new book, "BibliOdyssey". It looks great.
" We first met blogger PK and BibliOdyssey, his remarkable blog devoted to visual materia obscura two years ago. 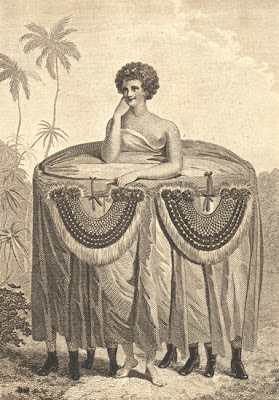 BibliOdyssey is the starting point on the net for uncovering eclectic archival imagery and the fascinating wealth of ephemera offered by libraries, universities and other institutions. 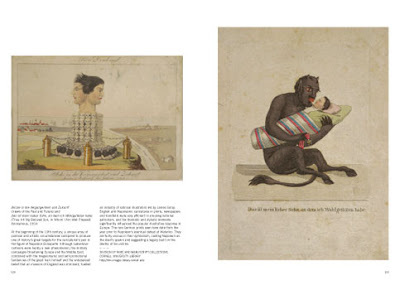 Now the blog has become a book, BibliOdyssey: Amazing Archival Images from the Internet, and it’s a perfect companion to the site." Read more of this post by Johnny at Drawn! , The Illustration and Cartooning Blog. I might have to get this book. I love this stuff! I have been painting non-stop for days now and have not had time to attend to my blog. It looks like I lost some subscribers and I hope you will all come back.Tomorrow is my final day of work on my new painting for the Green Show. I've been painting a couple of months on this one and I will be glad to be done. Then I can get back to blogging and preparing for my trip to Santa Monica and finishing the "Honeybee" painting. 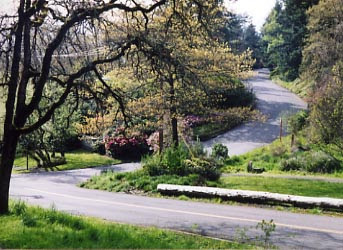 This is one of the roads where I take my daily hike. Since I have been painting 12 or 13 hour days, I have had to squeeze my little hike in just before dark. Emails are piling up and everything else is a mess. 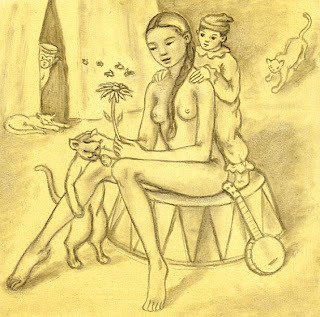 My little "Honeybee" painting is still not finished, so I can't show it to you yet. I had to put it aside to concentrate on a large painting that I am doing for the Green Show in Santa Monica, CA (opening November 17). The theme of the Green Show is nature and it will be very interesting to see the different interpretations. I'm sure it will be a show to remember. That reminds me, I need to reserve my plane tickets.